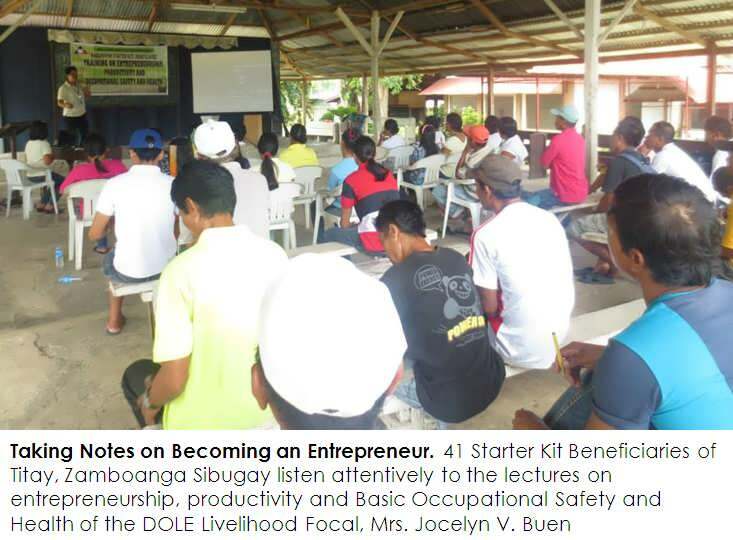 Ipil, Zamboanga Sibugay - The Department of Labor and Employment (DOLE) continues to promote livelihood programs for the informal sector through the "KABUHAYAN STARTER KIT" which aims to enable the target beneficiaries to easily start a sustainable livelihood undertaking. Aside from the livelihood tools and jigs given to beneficiaries, they also have to undergo training on Entrepreneurship, Productivity and Basic Occupational Safety and Health proving that the informal sector workers can also become successful informal entrepreneurs. There were two trainings held for the month of July. The first was on July 2, 2014 at the Fr. Antonio Hall, San Isidro Parish, Titay, Zamboanga Sibugay. There were 41 Beneficiaries (23 Male and 18 Female) who attended this seminar. The second training was on July 14, 2014 at Santiago Grill, Taway, Ipil, Zamboanga Sibugay with 76 beneficiaries (55 Male and 21 Female). 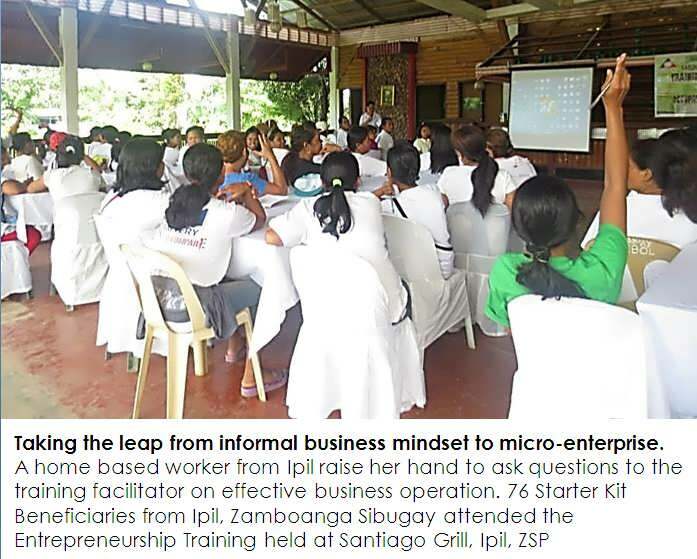 Ms. Jocelyn V. Buen Administrative Assistant III of DOLE Zamboanga Sibugay Field Office encouraged the participants to become entrepreneurs by developing the right attitude and behavior towards their own micro-enterprises. A good entrepreneur knows how to identify business opportunities based on the needs of customers at the right moment and place and most importantly an entrepreneur knows how to save money from the profit of the business. Participants were also oriented on Productivity and the Basic Occupational Safety and Health as a primary concern of the government to help this vulnerable sector heightened their awareness and establish protective measures on the various hazards in the workplace that they are always exposed to. The livelihood packages for the 117 beneficiaries include simple house-to-house service oriented skill: 18 Cosmetology Kits, 43 Carpentry Kits, 2 Masonry Kits, 30 Small Carenderia Kits, 20 Snack Vending Kits, 2 Curtain Making Kits and 2 Barber Services Kits. Before the distribution of Starter Kits in LGU-Titay, the DOLE Livelihood Focal, Mrs. Buen, asked the beneficiaries if they have paid their Community Taxes (SEDULA) and only to found out that majority of them were not able to pay their "sedulas". 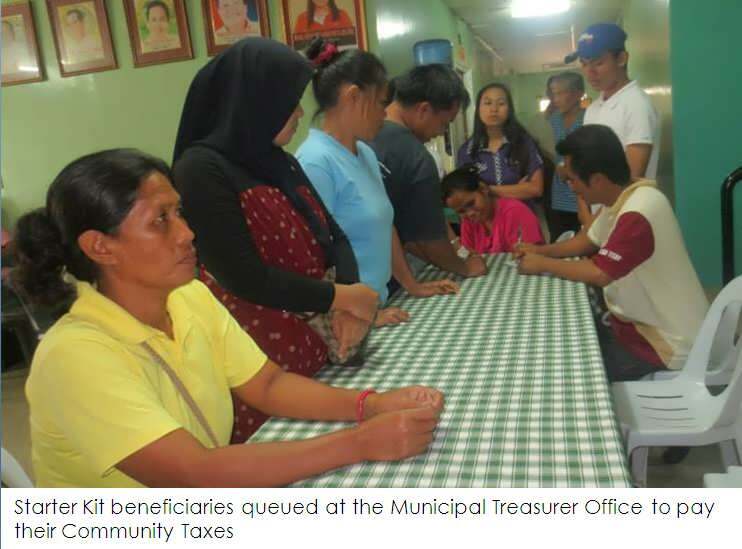 As a result they were asked to pay their community tax at the Municipal Treasurer Office of Titay in exchange of the Starter Kits. Female beneficiaries (mostly home based workers) paid ?12.00 tax while the male beneficiaries paid ?28.00 tax. Beneficiaries need to understand that the support given to them by the government comes from the tax of the public and as a responsible citizen they too should also pay their taxes. Regional Director Sisinio B. Cano of DOLE RO 9 gave a brief message to the beneficiaries during the awarding/ turn-over of the livelihood packages by urging them to maximize the opportunity given by the government and excel in their own respective businesses. Also present during the turn-over ceremony were ARD Albert E. Gutib of DOLE 09, Elamsalih E. Ungad, Field Office Head-DOLE ZSFO, Mayor Maria Esperanza Corazon D. Rillera of Titay-LGU together with her SB Members, Mrs. Lau Jajurie and Bobong Batan. In the words of the well-known Filipino Financial Adviser, Mr. Francis J. Colayco, "Wealth is within everybody's reach. All it takes is to have the proper discipline, determination, and decisiveness to be financially savvy, in order to maintain your chosen financial lifestyle.